I decided to go with the Gripping Beast Heroes of the Viking Age Ragnar Lothbrok figure for my Viking warlord. As my first SAGA games will pit Vikings against the Skraelings in the new world, I needed a figure that just not represented the warlike characteristic of the Viking race, but also more importantly their sense of adventure and exploration. Here we have a figure that is not just imposing in a military sense but one who is searching the horizons for new lands. I also have to say that my wife said the figure looked liked me, I may be just as heavy but certainly not as well built or tall. I believe she more equated my gray hair, receding hair line and beard with the figure. But so much for that, maybe I should shut up now! 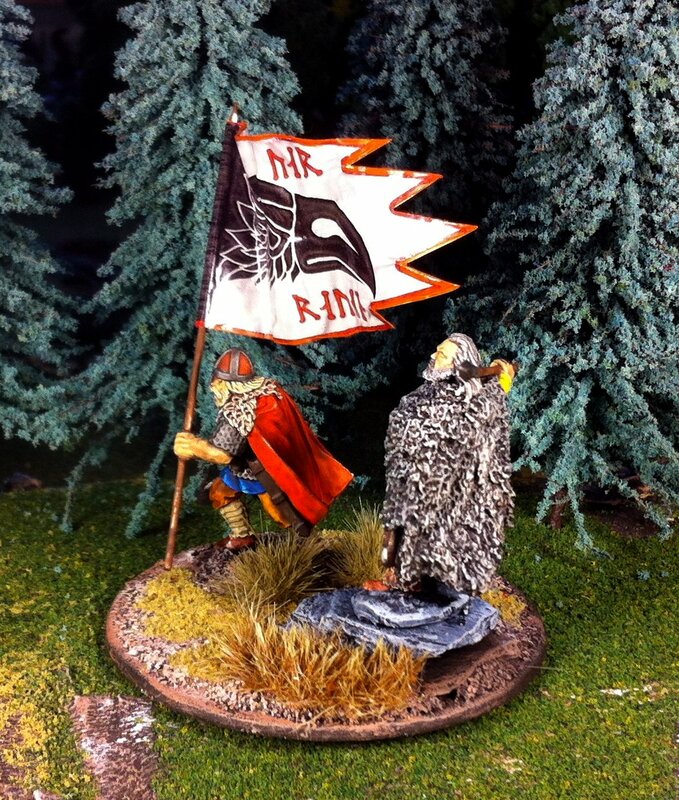 Like with my Skraeling Chieftain, I used a 60mm round stand and made it a small diorama of it. 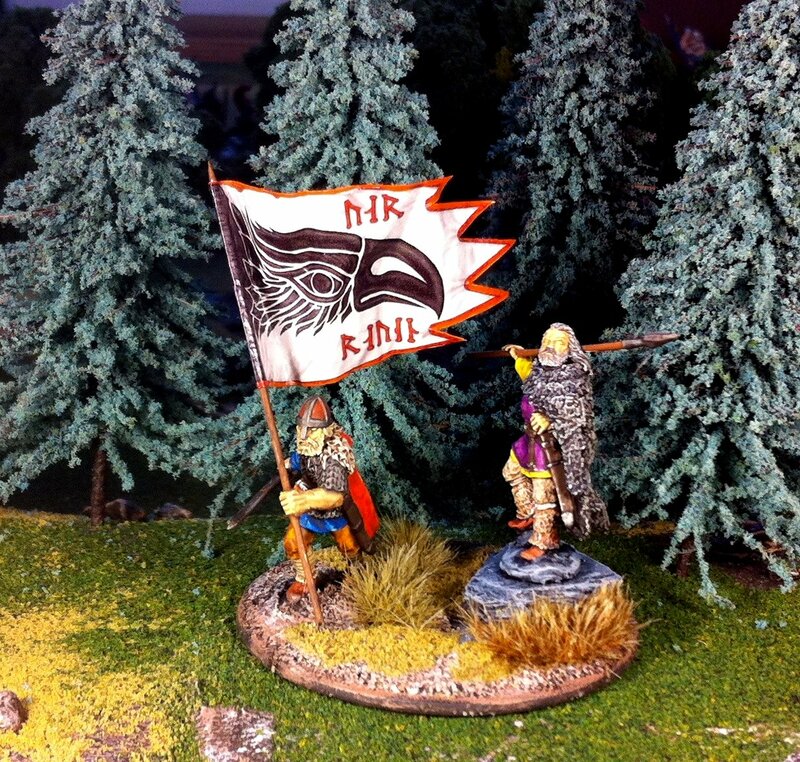 I added the Warlord that came with the Viking starter set, but converted the shield arm to a banner arm. The figures on the stand my look a little incongruous as one clearly is attacking while the other is just imposing, but with elevation of the warlord on a granite outcropping, I hope I made it work. The banner is a LBMS transfer, this is the first transfer I have used as a standard and it was interesting. I mounted it on household tinfoil, maybe I should have used a heavier product. But it came out looking quite nice and is much easier to manipulate then one on paper. I am sure most of you have heard the rumors about the disappearance of the Flagdude (I am still hoping that these are premature), but I believe I would consider this type of product as an alternative for my Napoleonic armies if available. I gave some thought to which historical character I should represent with my Viking warlord. 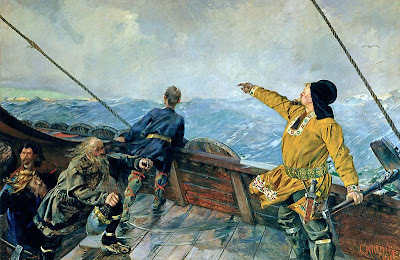 Leif Eriksson himself spent no time in Vinland. 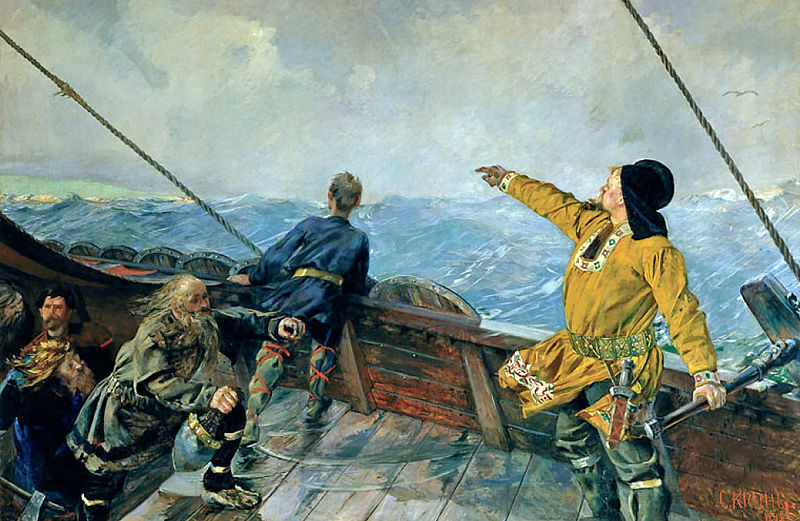 His brother Thorvald Eriksson, however, according to the Saga of the Greenlanders spent 3 seasons there before being killed by the Skraelings, so I thought he would be a better choice. I also considered Thorstein Eriksson, another of Leif's brothers and Thorfinn Karlsefni who marries Thorstein's wife Gudrid after he dies. Last of course is Freydis Eriksdottir, sister of Leif. Very interesting character and if someone comes out with an imposing female Viking, I will certainly be in line to make a purchase. Lots of great scenarios possible with her against the Skraelings as well as some Viking on Viking conflicts. The photos are not as the best quality as they were taken with my phone, my 16 year old daughter is going to Ecuador tomorrow and somehow or another got the little disk out of my camera. Well I think it has been a pretty successful month, I got 4 points of SAGA painted as well as two warlords, so just 28 figures left to complete for my two 4 pt starter war bands. I have also been painting some Napoleonics, of which I hope to post some photos of before the end of the month. Well done, John! I put my warlords on large stands as I too like to make mini dioramas of them. I love the idea of leaders on larger bases that can be built as dioramas. This is quite common in larger games, but you don't see it so often in skirmish games where base size has a larger effect on game outcome. 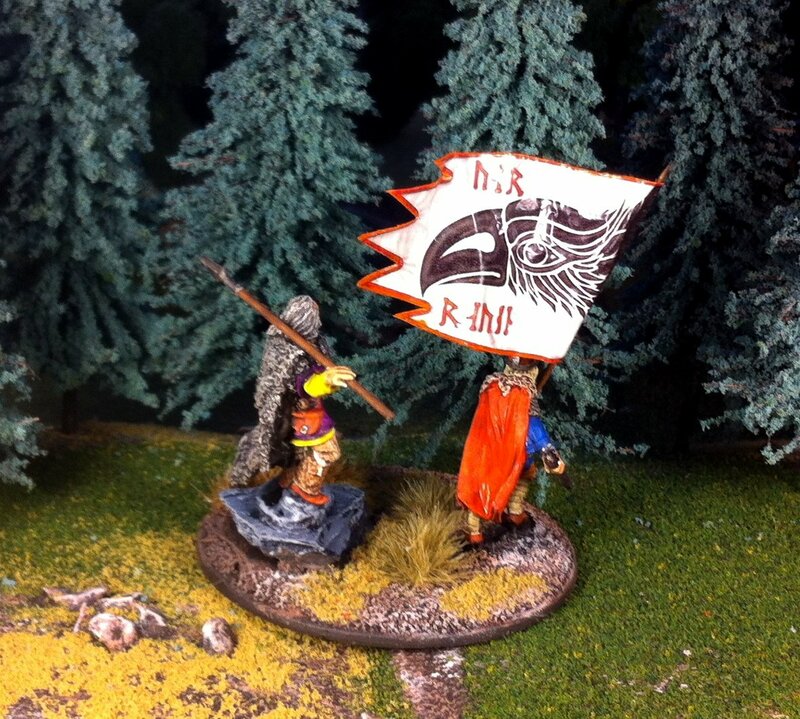 Great job on the figures John, love the flag too!! In direct response to (and inspired by) this post, I have been inspired to make my own command base. Look out for the rest of the posts.